Okay, this is the last one. I promise. Maybe. Yes, yes, I’m pretty obsessed with rhubarb right now. I can’t help it. Rhubarb just makes me so darn happy. Spring makes me so darn happy. You know what else makes me happy? Gin. 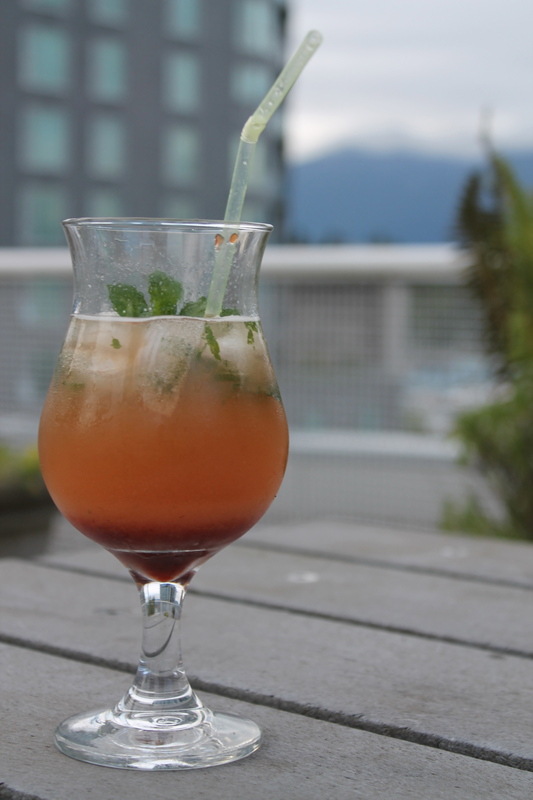 I should say, for the record, that mojitos are normally made with rum. The technique includes “muddling” which is basically squishing a few ingredients (usually some combination of fruit, mint leaves, and lime) all together to get them release their juices and oils. You then add the rest of the ingredients and shake it all together to make a tasty, tasty beverage. Mojitos taste like summer to me. They are bright, refreshing, and often incorporate seasonal fresh fruit. I like different kinds of liquor as the base for my mojitos, other than rum. I went through a phase a while back where I put Vanilla Vodka into all my mojitos. I like to use gin here, as it has has nice floral overtones that work well with the strawberries and the rhubarb. Make the rhubarb simple syrup: add the water and sugar to a saucepan. Chop the rhubarb and add it as well. Bring the mixture up a boil, and allow the sugar to dissolve into the water. Turn off the heat and allow the mixture to sit for about an hour until it cools and simple syrup turns a nice pink colour. Drain off the rhubarb solids and reserve the syrup. 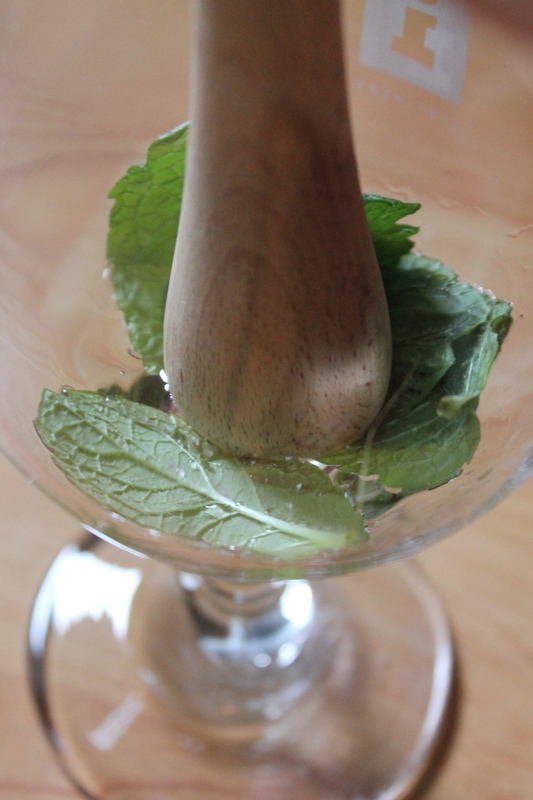 To make the cocktail: place 3 mint leaves in the bottom of your cocktail shaker, along with a roughly-chopped strawberry. Muddle together. Add 1.5 oz gin, 1 oz lime juice and 1 oz simple syrup. Top up with ice and shake well to combine. 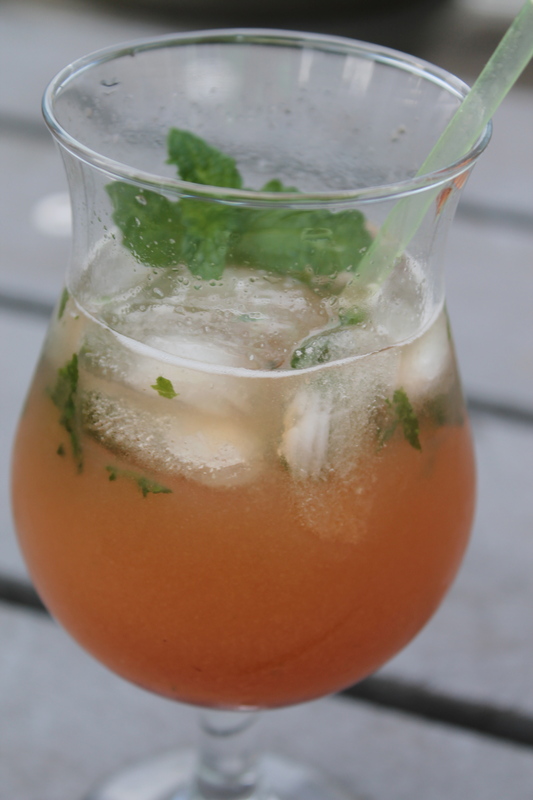 Strain into a glass and garnish with a sliced strawberry and mint leaves.